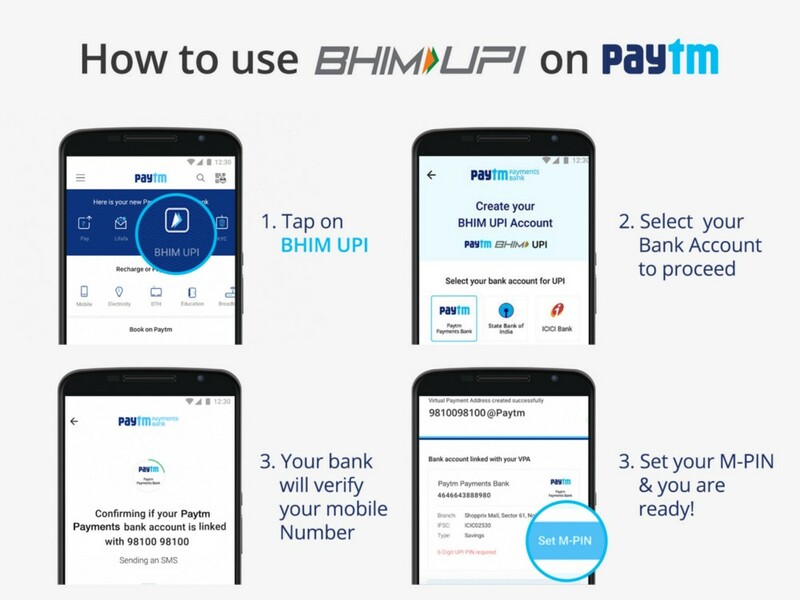 How to Use BHIM UPI on Paytm: Digital payments firm Paytm has integrated BHIM UPI, the government’s mobile payments interface, onto its platform as it looks to double its monthly user base over the next two years. We are welcoming BHIM UPI on our platform. We aim to be the country’s largest issuer and acquirer of UPI, and establish the most comprehensive payments system in the country. You can create your own Paytm BHIM UPI ID on the app, which will be your mobile-number@paytm by default. You can link any of their Savings bank account with this unique Paytm BHIM UPI ID and start sending & accepting money. Paytm BHIM UPI IDs are being accepted across all banks and BHIM UPI apps. 4. Set your M-PIN & you are ready! With Paytm BHIM UPI, you can now make seamless and instant money transfers directly between two bank accounts, with no waiting time to add beneficiary. You would not need your bank details or IFSC code to receive money as well. Now Paytm merchants can link their multiple existing bank accounts with Paytm BHIM UPI ID and accept money in whichever account they wish. As per the National Payments Corporation of India (NPCI) guidelines, users can send up to Rs. 1 lakh a day using BHIM UPI; while there’s no receiving limit. Paytm BHIM UPI is currently available in beta within the Paytm Android app and will soon be available on iOS as well. BHIM UPI (Unified Payment Interface) is a mobile payment mode that enables you to make instant money transfers directly between two bank accounts. Additionally, you can also make payments merchants who accept BHIM UPI as a payment mode for transactions. UPI ID (also called Virtual Payment Address or VPA) is a unique ID you need to create in order to send and accept money via UPI . Once a UPI address is created and mapped against your existing bank account, you can simply share your UPI address (eg. abc@paytm) with the payer. Once the payer enters your UPI address and sends the money, it will be directly credited into your bank account. How do I create a Paytm BHIM UPI ID? To create Paytm BHIM UPI ID, you can go to the BHIM UPI section on the Paytm app home screen. These IDs will be your registered mobile number. For example, if a Paytm user’s registered mobile number is 9123456789, the UPI ID will be generated as 9123456789@paytm. Can I edit my Paytm BHIM UPI ID? You are free to edit your Paytm BHIM UPI ID. You just need to click on your auto-generated Paytm BHIM UPI ID to set your custom ID. For eg: you can change 9123456789@paytm to ravishah@paytm. Can I link the UPI ID created on Paytm with multiple bank accounts? You can indeed link your Paytm BHIM UPI ID with multiple bank accounts. However, you will have to set a primary bank account to start sending and receiving money. You can change your primary bank account as and when required. I have an account with a UPI-enabled bank. However, I am unable to link the same to my Paytm BHIM UPI ID. Why can’t I transact using BHIM UPI when I log into a different device? In order to secure your transactions, we verify the mobile number and device that you used when you registered for BHIM UPI on Paytm. If you wish to use a different device to transact using BHIM UPI, you will need to complete the mobile number verification process that will be prompted on app. Your new device should have the SIM card of the mobile number with which you are registered on Paytm. Is it mandatory to open a Paytm Payments Bank account to create a Paytm BHIM UPI ID? It is not mandatory to create a Paytm Payments Bank account to create a Paytm BHIM UPI ID. However, you an earn up to 4% annualized interest on money stored in your Paytm Payments Bank account, which can go up to 7% in combination with financial services. Is there a per transaction limit on BHIM UPI on Paytm? You can transfer up to Rs. 1 Lakh per day using BHIM UPI, as per the government regulation. Where can I view my Paytm BHIM UPI transactions? I cannot find my Bank to link with Paytm BHIM UPI ID. Your bank should be UPI-enabled to be linked to your Paytm BHIM UPI ID. We keep our list of banks updated. There is no limit on the number of bank accounts that you can add to your Paytm BHIM UPI ID. Can I pay from my Paytm Wallet using my UPI ID? Both Wallet and UPI are two different funding sources. You can either pay using Paytm Wallet or using Paytm BHIM UPI ID. BHIM UPI PIN is a 4 or 6 digit PIN that can be used for authenticating your UPI transactions. Your UPI PIN will be validated by the bank whose account you are using to pay with. The UPI PIN is different for different bank accounts. How is my Paytm BHIM UPI PIN different from my Paytm password/passcode? Your Paytm BHIM UPI ID PIN is different from your login password or passcode. You will have to type the PIN that you have set to complete the transaction on all UPI-enabled banks and apps. What are the charges for transferring money using BHIM UPI? There are no charges for transferring money using BHIM UPI. What is the maximum expiry time that I can set while requesting money using BHIM UPI? You can set a maximum expiry of 45 days while requesting money using your Paytm BHIM UPI ID. 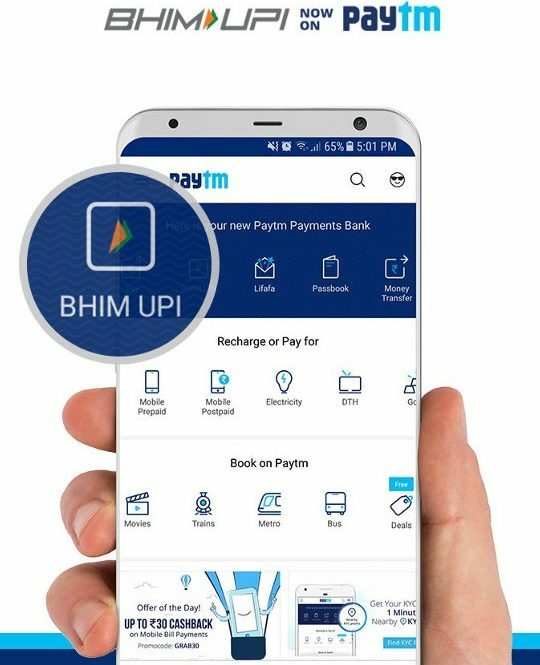 Is Paytm BHIM UPI live on Android as well as iOS? This feature preview is currently available on the Paytm Android app and will soon be available on iOS as well.